"Burn your AVI, DivX and XviD files to DVD"
If you have a lot of movies in the AVI file format that you wish you could enjoy on your TV, then you can make use of this application. iOrgsoft AVI to DVD Creator is the perfect solution to convert and burn home AVI videos onto DVDs that you can play on any home DVD player, which is perfect for sharing family videos with your relatives. It is a reliable application that works really fast while still providing high quality DVDs. 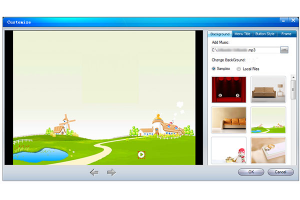 iOrgsoft AVI to DVD Creator features a simple and friendly interface so anyone can use it. The application can burn AVI, XviD and DivX movies to different types of DVD discs, including: DVD-R, DVD+R, DVD-RW, DVD+RW and DVD+R Dual-Layer. Additionally, you can use this program to generate ISO files, and burn them later. This program also allows you to clip certain segments of videos, and burn all the parts onto a DVD at once.